Mayne Stage (1328 W. Morse Ave.; 773-381-4554) announces several new shows for its fall performance schedule including an evening of Brazilian music, artists from the Chicago Guitar Festival, acclaimed indie rock music and more. On Saturday, August 14 at 8 p.m., transport to South America with the upbeat sounds of Brazilian music with “Brazil in Chicago—A Tribute to Breno Sauer.” The first set at 8 p.m. presents The Copacabana Trio featuring Luciano Antonio on guitar and vocals, Neusa Sauer on vocals and Geraldo de Olivera on percussion, followed by the Luciano Antonio Quintet featuring Luciano Antonio on guitar and vocals, Rob Block on guitar, Eddie Gerber on bass, Felipe Fraga on drums and Geraldo De Oliveira on percussion. The 9:30 p.m. set features solo vocalist/guitarist Paulinho Garcia, who is then joined by saxophonist Greg Fishman to comprise Two for Brazil. The lineup expands to become the Paulinho Garcia Ensemble with Paulinho Garcia on solo guitar and vocals, Geraldo De Oliveira, Dede Sampaio and Heitor Garcia on percussion, and Greg Fishman on saxophone. After a second intermission, the third set begins at 11 p.m. with Som Brasil, a tribute to pianist Breno Sauer, featuring Breno Sauer on piano, Neusa Sauer on vocals, Paulinho Garcia on bass, Dede Sampaio and Geraldo De Oliveira on percussion. Doors open at 7 p.m. Tickets for the show are $10 in advance, or $15 on August 14. Tickets are on sale now at www.maynestage.com or (773) 381-4554. Coinciding with the Chicago Guitar Festival this fall, The Andreas Kapsalis and Goran Ivanovic Guitar Duo is performing a CD release show at Mayne Stage Thursday, October 7 at 8 p.m. The guitar duo celebrates the tradition of guitar performance of the old and current material, and as composers, are part of a movement in the U.S. whose aim is to build the new repertoire for the next generation of guitarists. 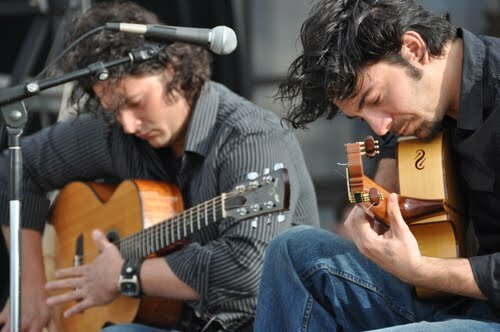 Steel string 10-finger tapping guitar prodigy Andreas Kapsalis with nylon string classical guitarist, Goran Ivanovic, have fused their musical roots with modern, classical, world, jazz and beyond. Learn more at www.akgiduo.com. Doors open at 7 p.m. Tickets are $15 and on sale now at www.maynestage.com or (773) 381-4554. 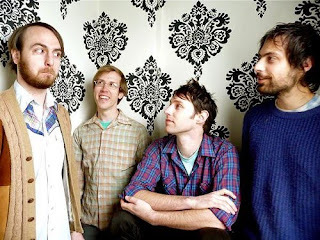 Drew Andrews & The Spectral Cities perform at Mayne Stage Friday, October 8 at 8:30 p.m. Enjoy the child-like world of ethereal sounds and quiet instruments, framed by gentle acoustic fingerpicking and lush, present vocals. Drew Andrews, a San Diego-based indie balladeer, has been in the music world for some time. His previous musical projects include The Album Leaf and Via Satellite. Andrews released a solo debut, Only Mirrors, in 2008 which was nominated for “Album of the Year” and “Best Alternative Album” the 2009 San Diego Music Awards. His follow-up album, Playing Birthday Games, released earlier this year. Learn more at www.myspace.com/drewandrews or drewandrews.org. Doors open at 7:30 p.m. Tickets are $8 in advance and $10 on October 8. Tickets go on sale Friday, August 13 at www.maynestage.com or (773) 381-4554. On Thursday, October 14 at 8:30 p.m., enjoy the sounds of Hosannas at Mayne Stage. Formerly named “Church,” Hosannas, of Portland, Ore., has gained a notable following for the almost-lifelong collaboration between bandmates the Law brothers. The Hosannas’ diverse instrumentation includes a mix of Bollywood samples with tin-foil piano, tribal crescendos and hard-hitting guitar. Learn more at www.hosannasmusic.com or www.myspace.com/songforcecrystal. Tickets are $10 in advance or $12 on October 14. Tickets go on sale August 13 at www.maynestage.com or (773) 381-4554. Upcoming shows at Mayne Stage are announced every Tuesday, with tickets to new shows on sale each Friday. Stay up-to-date with upcoming shows at www.maynestage.com.